I've been wanting to make my own custom bicycle headbadge for a while now and finally found the way to do it. Some cardboard, a pencil, an X-acto blade, previous experience in drawing, some imagination, a small drill and a jeweler's saw was all that you need to make this happen. 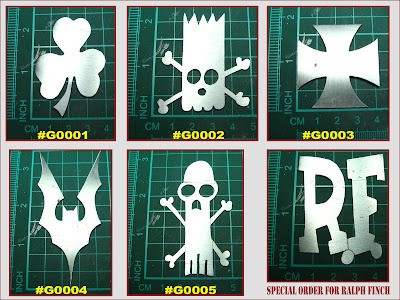 You can cut your headbadge from any sort of flat sheet metal. I prefer to use Aluminum since it is pretty easy to cut and most of all, cheap. I make a drawing first of my design on cardboard that I then cut it out with an X-acto blade. I then transfer the design by going around the piece with a sharp pencil on the sheet of aluminum itself. Sections that are inside (like the eyes and nose on the skull and bones) are drilled with a hole so the saw blade can be put in there to cut. I cut the headbadge and finish with a small file to clean things up. All I have to do afterwards is bend the headbadge and stick it to the bike with some epoxy (most permanent) or clear silicone (can be removed). The jeweler's saw and blades can be found at hobby stores or a friendly jeweler that can buy it for you or order it. If you don't feel like making your own, you can buy one of mine. The models below are available for $10 USD each paid thru Paypal, shipping is included for anywhere in the world. They are made from brushed recycled aluminum sheet and are shipped flat to keep cost at a minimum. I can also do custom work, just email me with your idea and I'll give you a quote.